Refined, sometimes understated, and always stylish, high-end chairs immediately upgrade a room’s decor. Adding a distinctive seat to the living room or other space creates interest and changes the perception of your decor. These types of chairs are made from quality materials with precise hand-crafting, often by well-known designers. More than just a piece of furniture, a high-end chair is an investment. Just look at the prices on the vintage versions of iconic chairs from decades ago and it’s clear that they maintain value – if not increase! 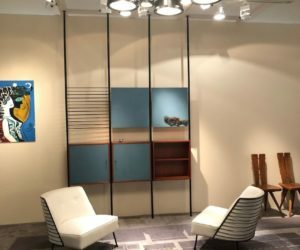 We found two dozen chairs of all kinds at The Salon Art + Design that would elevate the decor of any home. See which ones appeal to you and think about investing in a quality piece when it’s time to redecorate. Stephenson’s chair is shown by the Maria Wettergren Gallery. It would be a crime to hide the Bloom chair by Hannes Stephensen under a dining table. The finely crafted wooden chair has an amazing seat design of inlaid wood. It is the third seat that Stephenson has design in collaboration with the Egeværk workshop in Hundested, Denmark, which is an old fishing town on the north coast of Zealand. It is said to embody a number of contrasts: light and shadow, feminine and masculine floral characteristics, and experimentation. 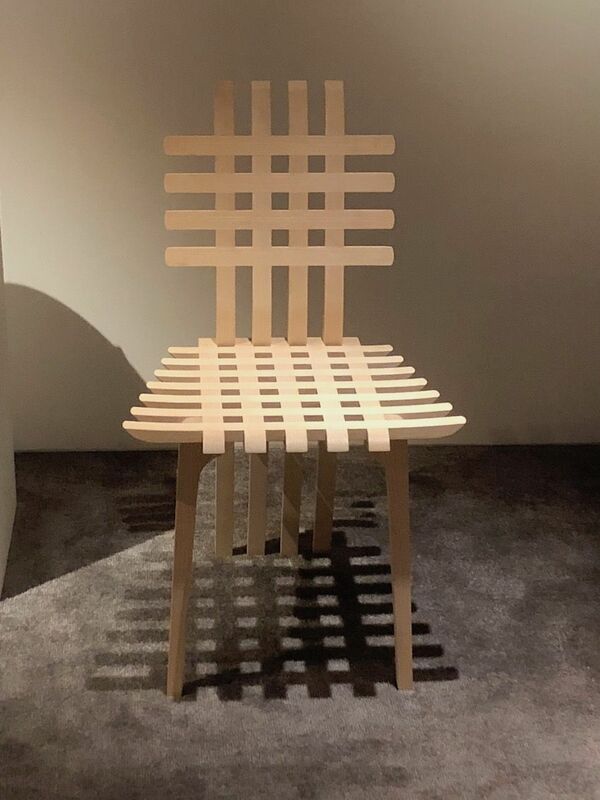 This chair is crafted from ash wood. This second chair by Stephensen is called A Touch of Mac. It too was designed by Stephensen in the Egeværk workshop. It is inspired by Scottish architect Charles Rennie Mackintosh, who was a representative of the Art Nouveau in Great Britain in the 1900s. He was known for furniture that was beautiful but impossible to sit in. Stephensen’s chair is an attempt at a formal chair for museum environments that you can actually sit on. The shape and color of this Eddie Harlis chair add to its fun nature. 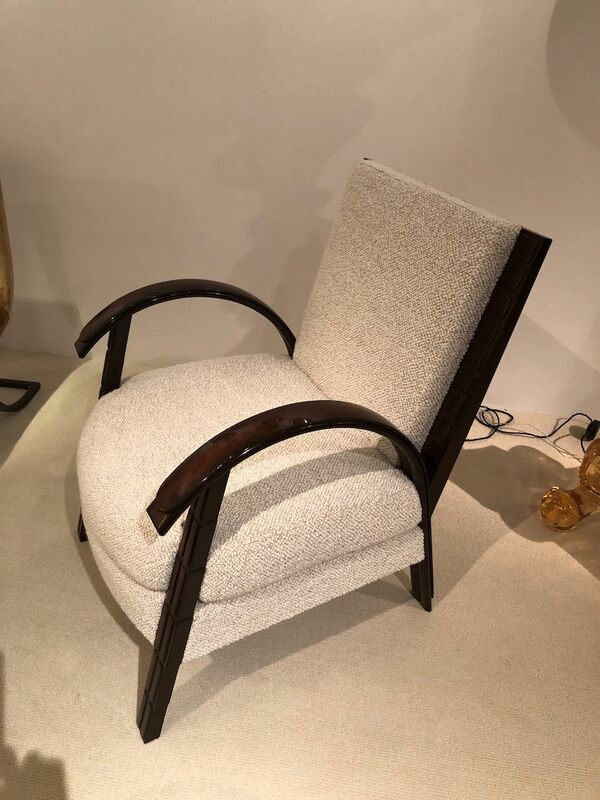 A very mod chair by German designer Eddie Harlis from the 1950s was presented by Galerie Hervouet of Paris and it looks as current now as it did then. The furry purple upholstery combined with the white mid-century modern legs is a marvelous style that will work in so many of today’s homes. It’s just quirky enough to be special without overwhelming. We’d love to add it to a modern living room. The glittering mosaic finish adds to the regal feel of this chair. 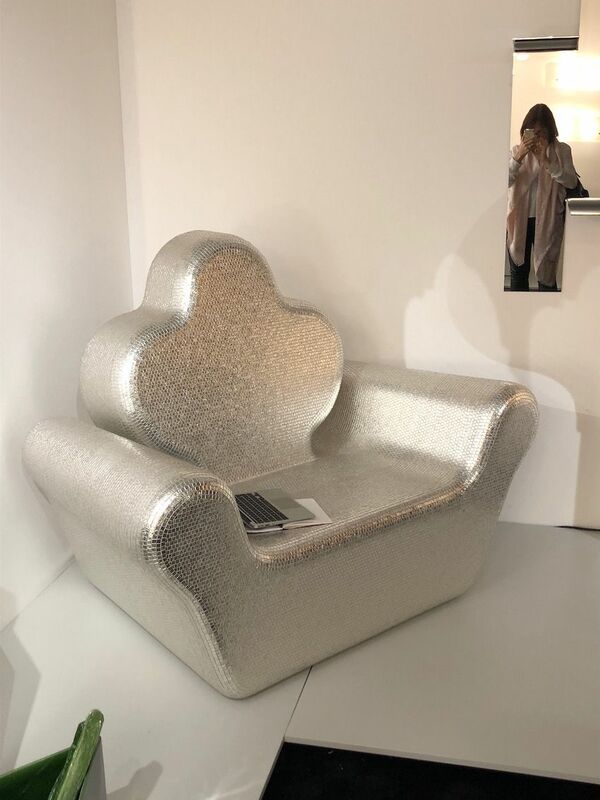 This shiny throne-like seat is the Poltrona White Gold Armchair designed by Alessandro Mendini. The surface is vast covering of Bisazza mosaic that was gilded with white gold leaf. Produced and presented by Galerie kreo, only a limited edition of eight were produced along with two prototypes and two artists proofs. Such a dazzling piece will really catch attention like none other in a room. The sweeping wood design is very dramatic. 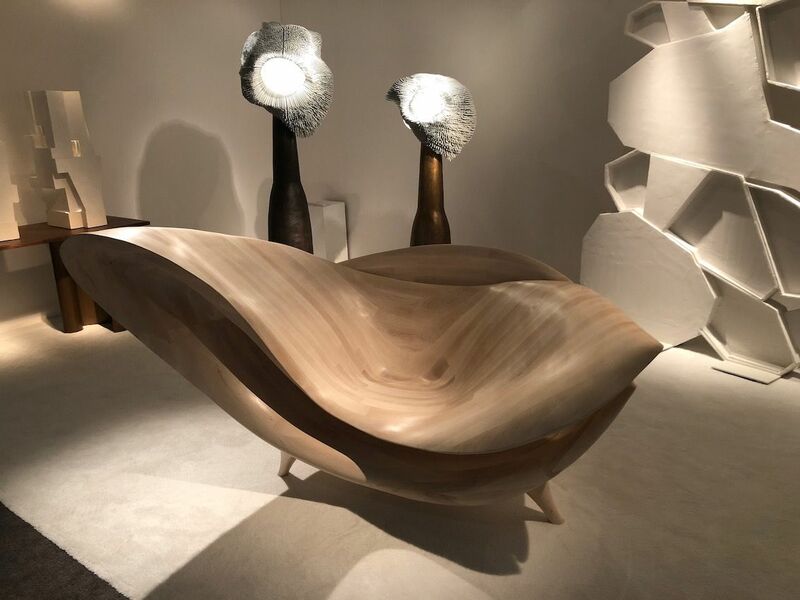 A sweeping piece that dominates the area, the L’Infini chair by Gildas Berthelot is a hand-carved masterpiece. Gorgeous grain and an unbelievable fold of wood form the seat, which features a dramatic swoop to one side. The seat is carved from bleached maple and is also available in ebonized maple or bleached walnut. For those who have space considerations, it comes in three sizes, all in limited editions of three. They were shown by Galerie BSL. Bonetti’s rounded forms are comfortable and visually appealing. 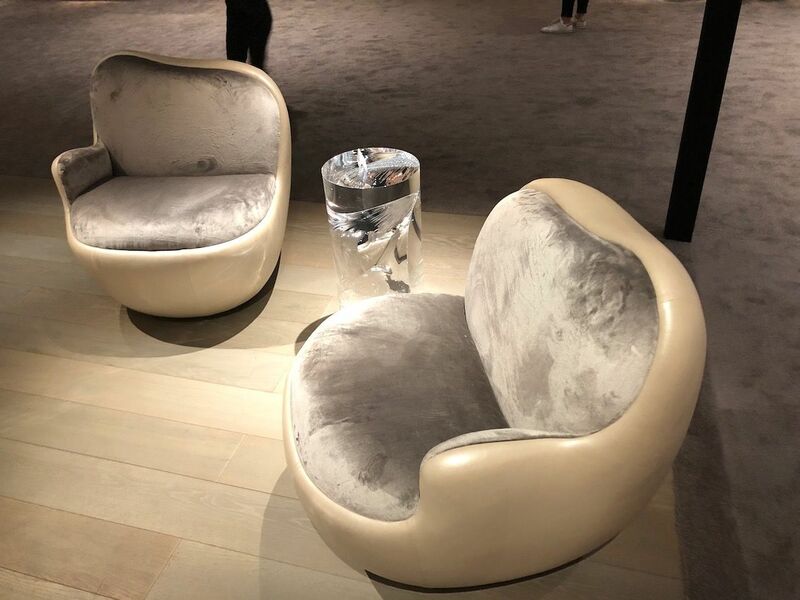 These fluid armchairs from the David Gill Gallery are by Mattia Bonetti. The Paris-based artist and designer created these Ball armchairs in 2012. Crafted from a fiberglass structure, they are covered in both an upholstery textile and leather. The shape is lovely, especially with the opposing arms. 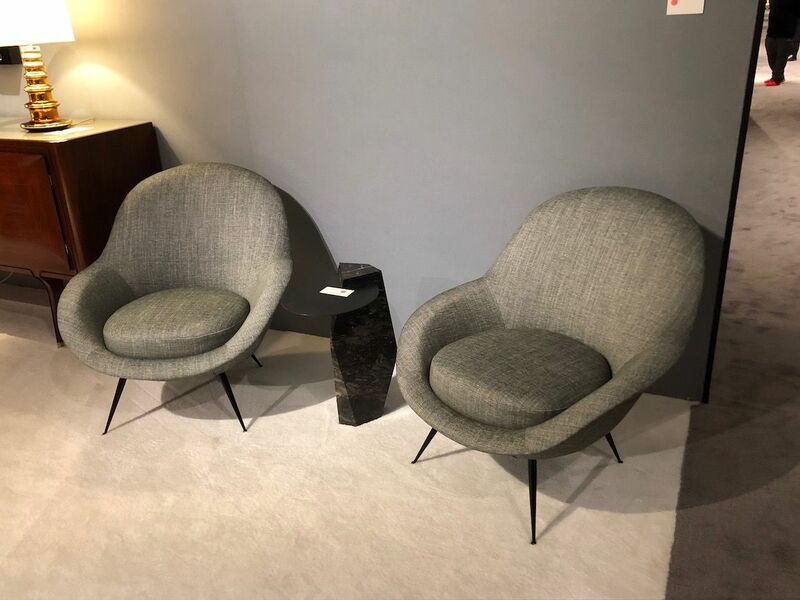 As a pair, the design encourages a feeling of connection between those seated in them and are ideal for conversation. The wooden armrests are a nice accent on this armchair. 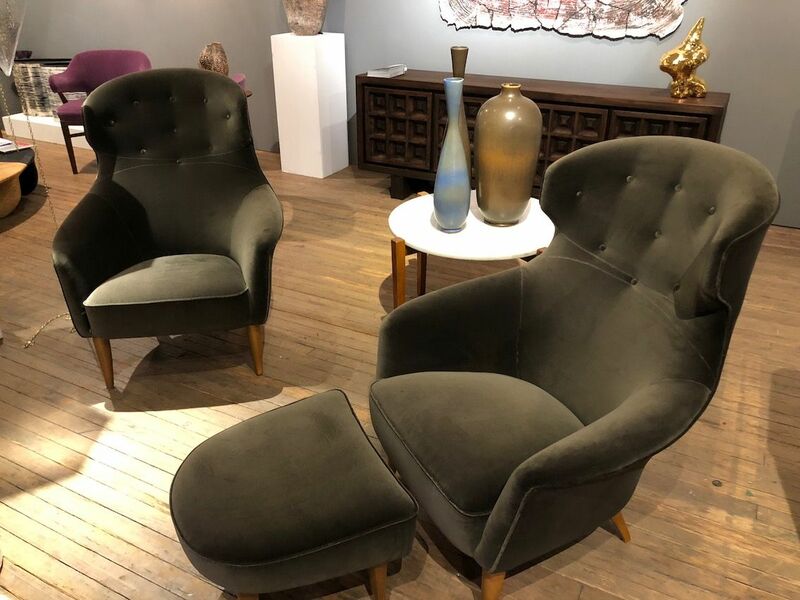 Also from Galerie Hervouet of Paris, this comfortable armchair has a mid-century sensibility yet is still very fresh for today’s contemporary spaces. Versatile, neutral upholstery is accented with glossy wood accents on the armrests. This sophisticated type of chair would be a perfect addition to a living room, den or bedroom. Some vintage chairs are rare finds. 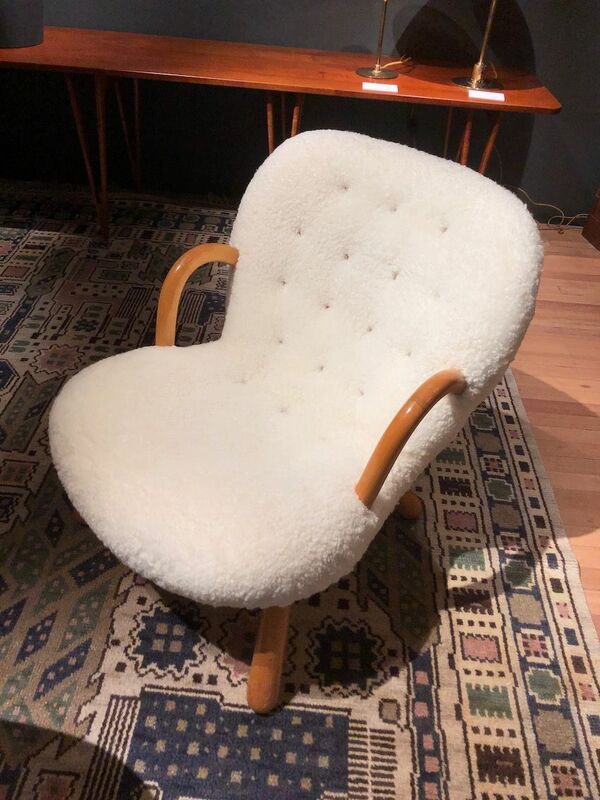 Vintage types of chairs in pristine condition like this one from Demisch Danant are an excellent way to add style to your living room. The Low Chair was created by Jacques Dumond in 1954. Dumond was considered to be a very influential designer of the French modernist movement. This style — and his works — are characterized by functionalism, minimalism, and a reduc­tive perspective on ornamentation. The chair has a wooden structure, upholstered foam seat, and legs made from cherry. This 20th-Century design will never go out of style. 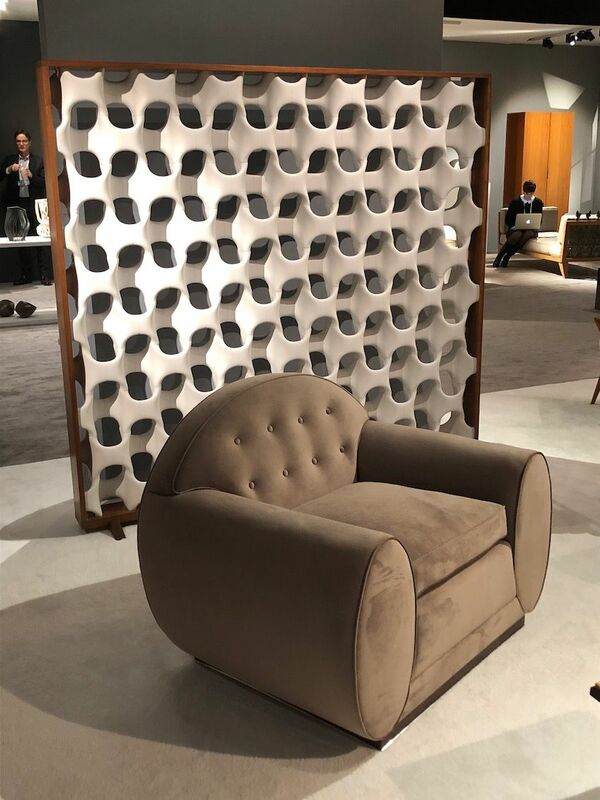 Similarly, this chair from Galerie Chastal-Marechal, which specializes in important 20th-century French designers, is a refined design. Designed by Eugène Printz (1879-1948), it is one of a pair that was created circa 1930. Made from solid rosewood, the straight, angular back of the chair is a contrast to the arched armrests that are supported by angled legs. Both the legs and the wood on the sides of the back are fashionably carved. 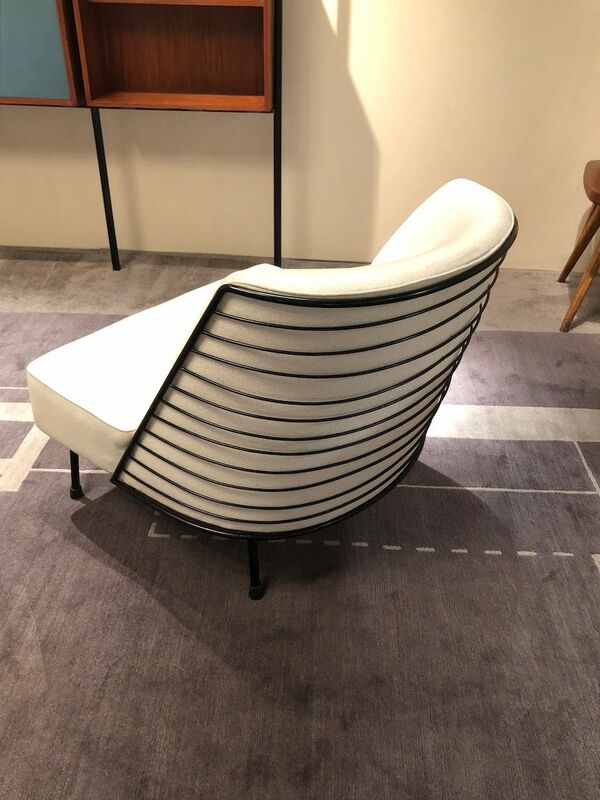 The upholstery is an ivory linen and wool blend by Pierre Frey. 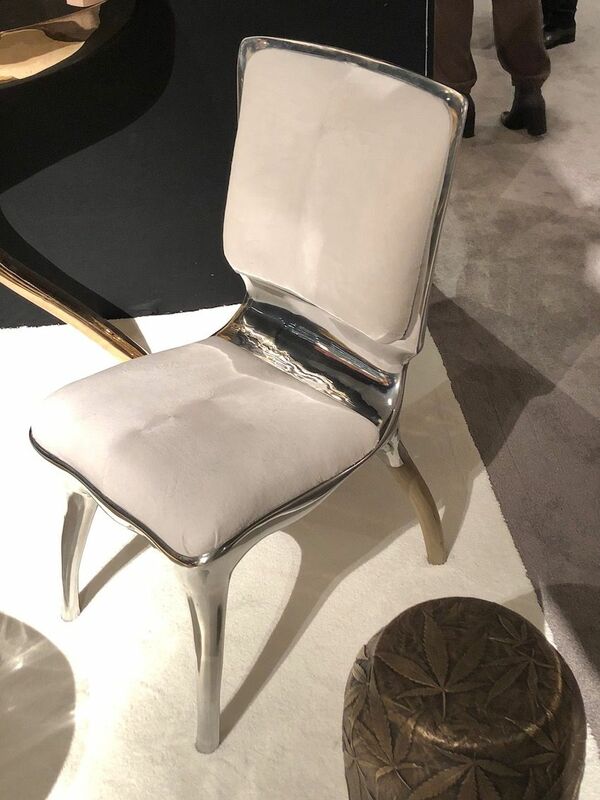 An asymmetrical metal accent piece adds to this chair’s distictiveness. 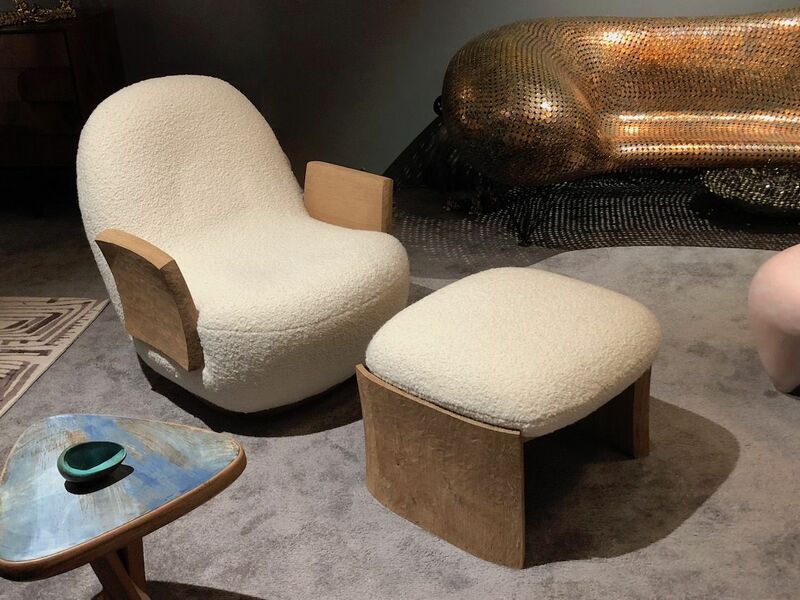 Another rounded beauty from Mattia Bonetti is the Ontario armchair at the Twenty-First Gallery. Produced in 2015, the chair features silk wool velvet upholstery covering a stamped wooden frame. The metallic accent at the bottom is a trio of smooth, rounded shapes finished in gold leaf. 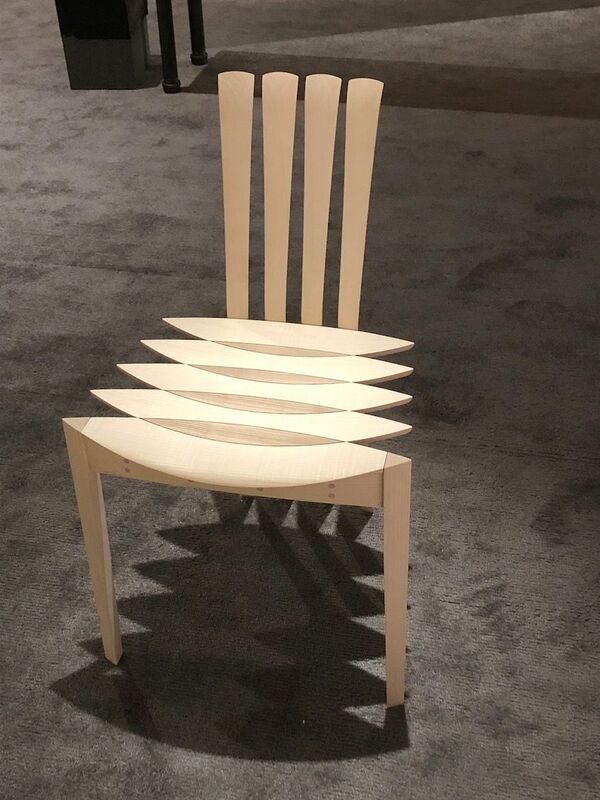 The chair was made in a limited edition of 24 pieces. Again, the neutral color and soft, sophisticated styling are ideal for elevating the decor of any room. The slight winged flair on these chairs is very attractive. When the design and bones are good, vintage chairs can have a long life. 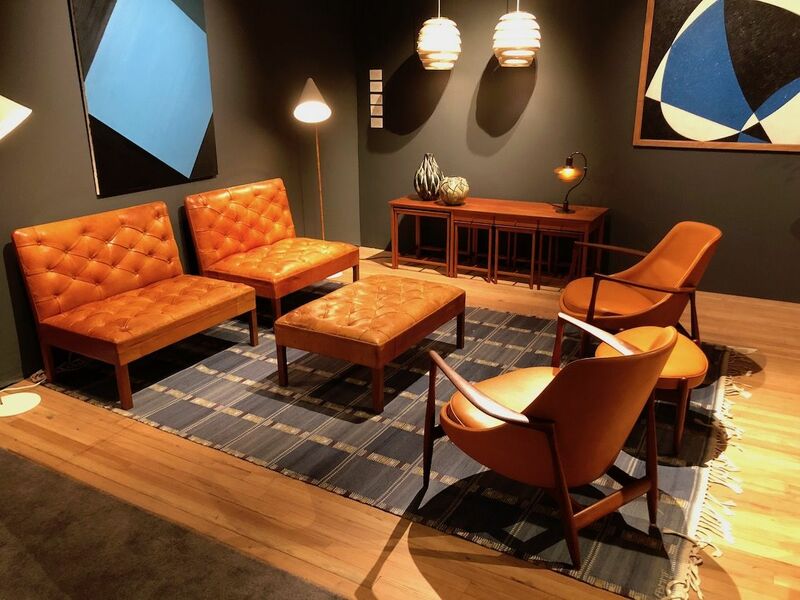 These armchairs and footstool were created by an anonymous Swedish designer circa 1940. It is crafted from birch wood and features new upholstery. 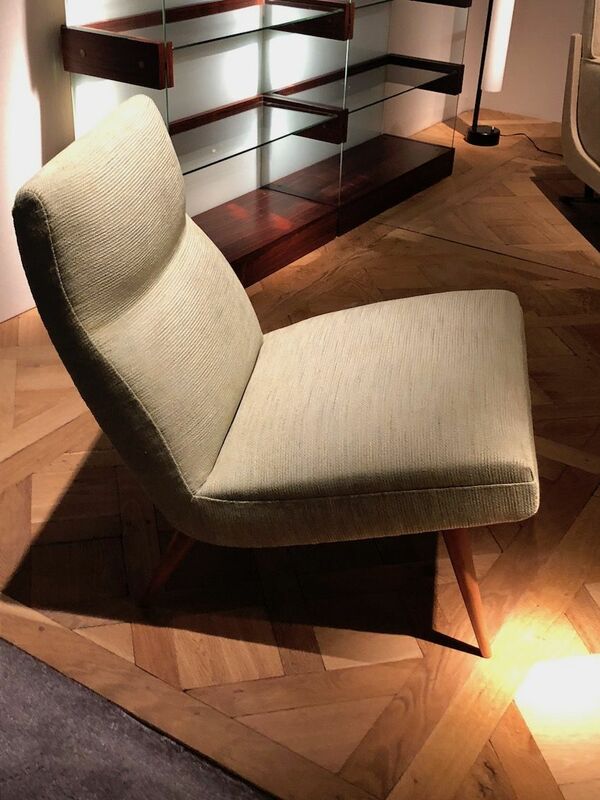 Available from the Hostler Burrows gallery, the chair is a timeless design that is comfortable and fresh for any space. The footstool in an elongated hemisphere shape is an especially nice addition, essentially turning it into a wonderful lounging seat. Vintage Art Deco pieces add immediate glamour to a room. 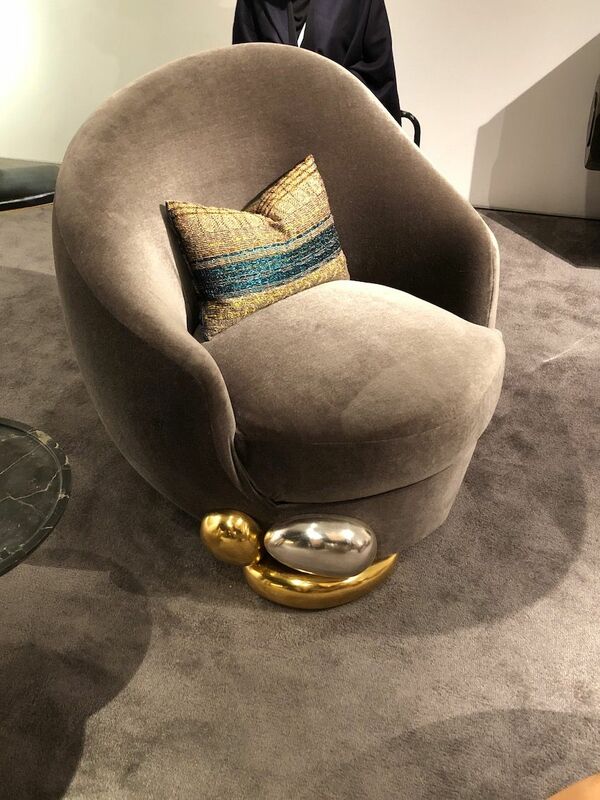 Vintage Art Deco pieces are really spectacular furnishings, as is this glamorous armchair by René Drouet. 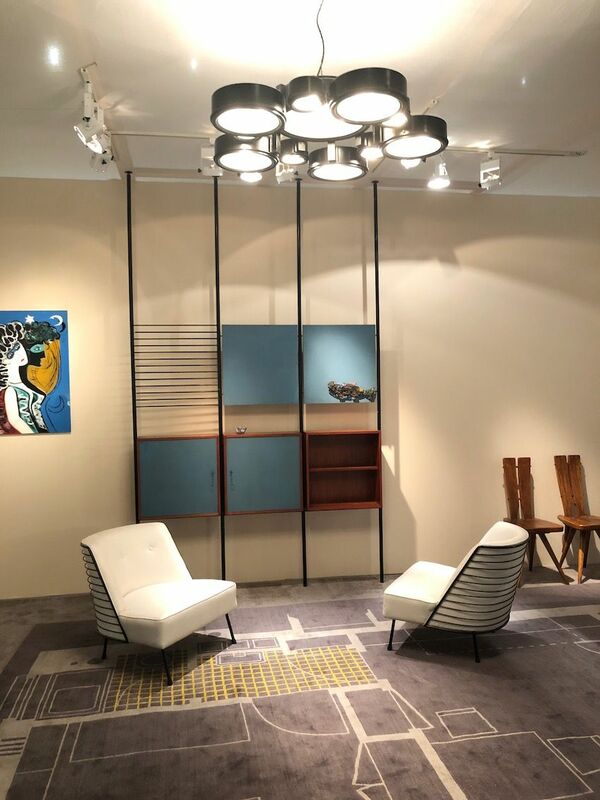 Part of a set that includes a sofa, it was designed by the French visual artist whose early career included working as an apprentice to Galeries Lafayette master designer Maurice Dufrene. Crafted in 1938, the plump shape and curved lines are classic art deco and the shape of the armrests is strikingly attractive. Offered by Karl Kemp antiques, it’s a really special type of chair. Italian modern pieces are versatile and always in style. This pair of chairs is also from Karl Kemp Antiques but with a decidedly different style. The Italian modernist chairs feature a clean and minimal silhouette. The mid-century modern seats feature dark metal legs and a rounded seat upholstered in a masculine gray fabric. These marvelous chairs would really work in just about any space. Decades-old Scandinavian designs like these are quite special and still stylish. A living room setting by Modernity Gallery features several wonderful chairs. 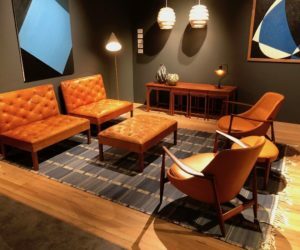 At left are two seats with a matching footstool designed by Kaare Klint for Rud Rasmussen. Crafted in 1933, they are made from Cuban mahogany and original Niger leather. Klint is considered the father of modern Danish design and was inspired to create these seats by French rococo sofa. This design is actually considered a modern sectional, but in today’s world, we think they look more like generous armless chairs. These Brazilian chairs have a European modernist style. On the right is a set of armchairs and footstool that were originally called the U-56, but were renamed the Elizabeth after Queen Elizabeth II purchased a pair in 1958. 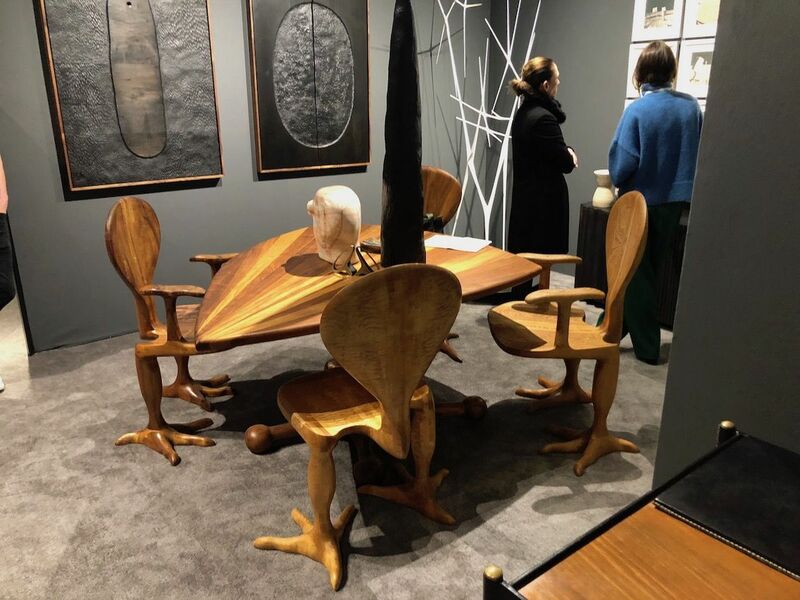 The teak and leather chairs were designed by Ib Kofod Larsen for Christensen & Larsen in 1956. Together, these pieces form a fabulously stylish Danish living room. The back of the chair has a very different style of back. 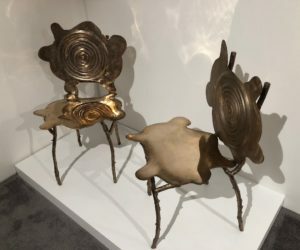 A unique pair of rare armchairs by Joaquim Tenreiro, one of the among the leading Brazilian furniture designers in the mid-20th century. It’s a very different design that has the classic mid-century modern lines but also features an intriguing back. The black iron lines not only form the support for the upholstery but also add an uncommon design feature. Tenreiro was among the first designers in Brazil to work in the European modernist style. Animalistic features make these chairs whimsical. Who says dining chairs can’t be fun? These Chicken Dining Chairs from the 1970s were carved from maple by artist Tim Mackaness of Oregon. They are paired with the Frog dining table, also created by Mackaness. It is made with an inlaid top of carved oak, black walnut and koa wood, with a whimsical frog-footed base. Even just one of these types of chairs would enliven a dining area thanks to the poultry-inspired feet! Classic Scandinavian design and sheepskin upholstery add up to a very appealing chair. From the 1940’s, Philip Arctander’s Clam chair is a marvelous piece of Scandinavian modern design. The birch frame is upholstered in new sheepskin, accented with brown leather buttons in the tufting. It’s another vintage piece with fabulous bones and a timeless design that has become a real collector’s piece. Although an entirely new piece, this chair has a vintage vibe. With some of the same Scandinavian sensibilities in a modern design, the Mad chair by Pierre Yovanovitch is a new piece that is sure to become a classic. The hand-carved chair and footstool are oak and the upholstery is by Ateliers Jouffre of Lyon. 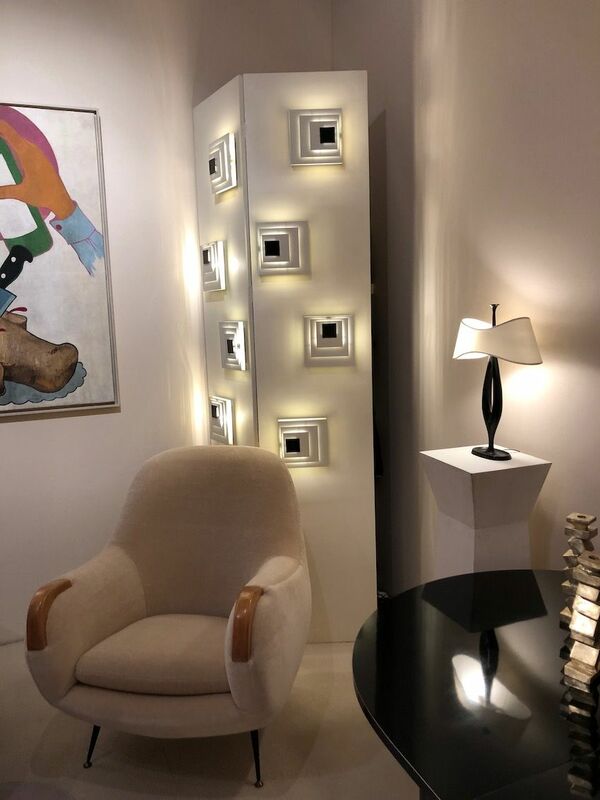 Yovanovitch had a previous career as a menswear designer for Pierre Cardin before opening his own furniture design atelier. His haute couture style is known for melding high art, architectural elements, and vintage furniture. It is available through R and Company. Angular and modern, this chair uses parts from old cell phones. 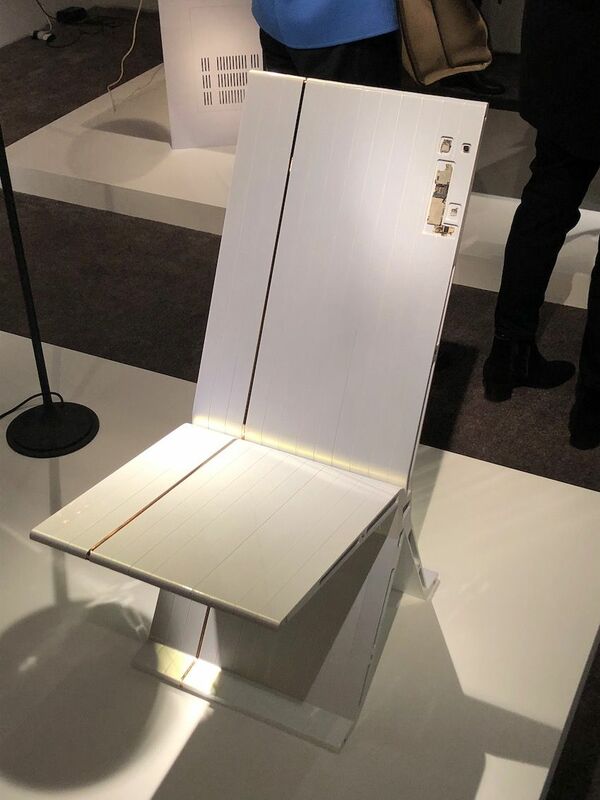 Most definitely a piece for the modern era, this chair combines a minimalist silhouette with materials that are only available to current society: cell phone components. The Ore Streams chair by Formafantasma is stark and angular and is made from aluminum finished with metallicized car paint and gold-plated aluminum. The limited edition chair was conceived and created by Italian designers Andrea Trimarchi and Simone Farresin of Studio Formafantasma based in Amsterdam. Brazil’s Campana brothers create chairs with unexpected features. 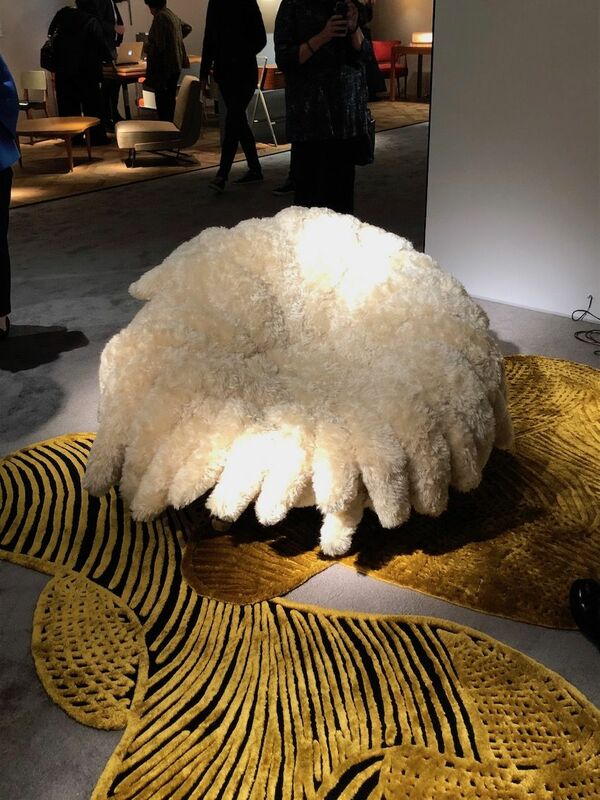 A loveable bowl of fluff, this chair just beckons you to plop down and snuggle in. 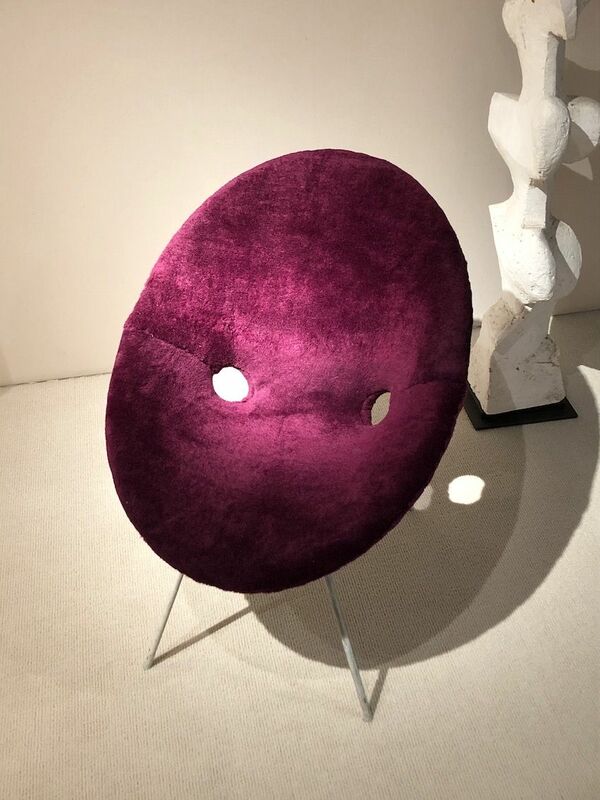 Designed by the legendary Campana Brothers, the Abbraccio armchair is crafted from wool mohair and perspex. The limited edition design is available from Giustini/Staggeti in six different colors of mohair. 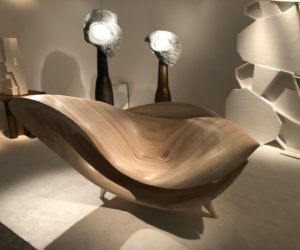 Among Brazil’s foremost contemporary designers, Humberto and Fernando Campana are known for their wide range of intriguing designs. Sanguino’s chairs are small in size but big on abstract style. 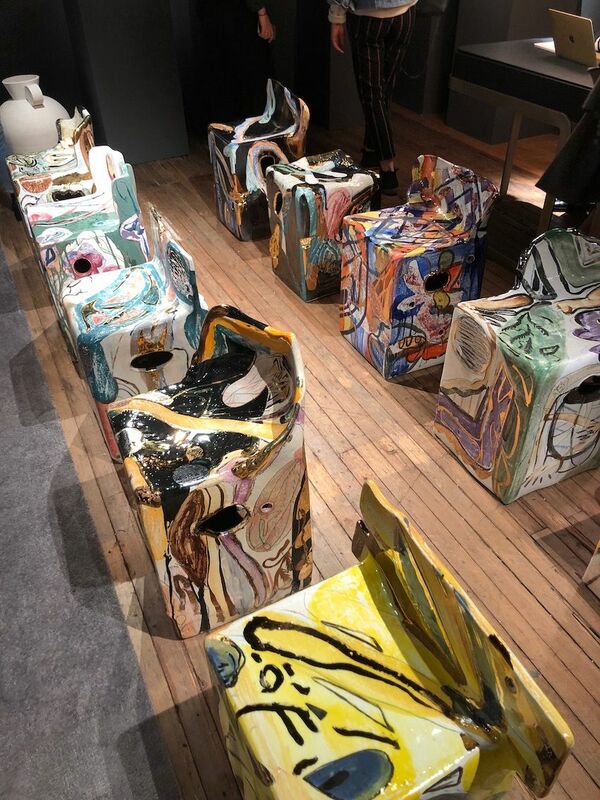 This array of brightly abstract ceramic chairs is by Venezuelan-born designer Reinaldo Sanguino, who is now based in New York. Sanguino is known for his richly patterned pieces that are each unique and freely formed. His use of clay is novel and serves as both the structure of the seat as well as the surface for embellishment. They are versatile and highly decorative seats that will be an instant conversation piece in any room. Roskin’s chair also has animalistic features. Polished aluminum and walnut are melded into this slightly animalistic chair by Alex Roskin that is offered by the Todd Merrill Studio. Called the Tusk Chair III, it reflects his liking for this type of form. Its hand-sculpted shape has an organic, mammalian vibe that is unusual. The front legs are cast aluminum but the back legs are made of hand-carved wood. The seat and back are covered in a white pony. Either around a dining table as a set or individually as an accent chair, the Tusk ends up being quite a versatile type of chair. These Rorschach chairs are too special to hide under a dining table. 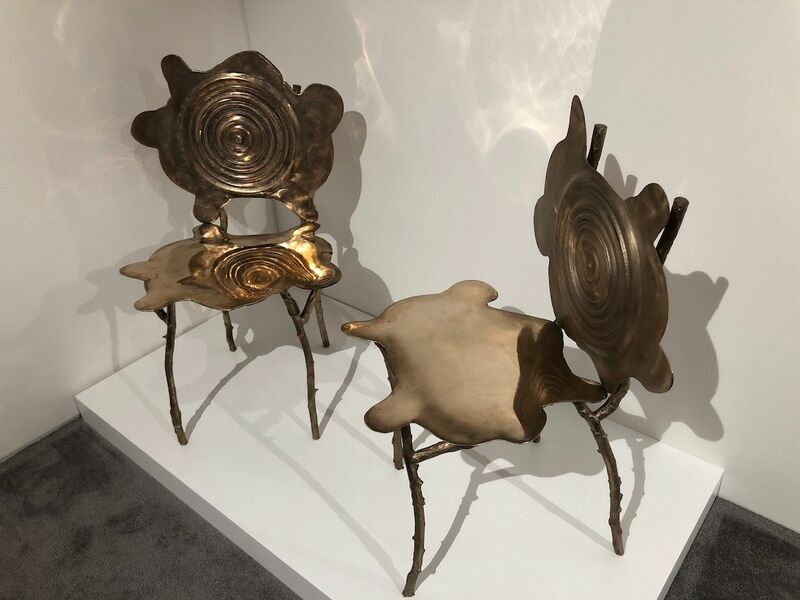 These Rorschach chairs from the Wexler Gallery are aptly named because the backs and seats resemble puddles or splotches. Gregory Nangle, metal worker and glass artist, designed these seats that also feature swirls that look like the cross-section of a tree. Nangle is known for often using natural elements like wood, rocks and leaves. While these are the right size for being used as dining chairs, we’d hate to see them hidden under a table, with their irregular shapes and tree-limb legs. From special vintage finds to modern designs that break the mold of what is sometimes considered a chair, high-end seating can totally transform a space. Whether that means a full set of dining chairs or just a vintage find to highlight the living room, these types of designs can bring new life into a space. The post 24 Drool Worthy Types of Chairs to Invest In appeared first on Home Decorating Trends – Homedit.